May 15-17 Are you overwhelmed yet? Are you overwhelmed by the possibilities for this weekend? No? Well, I have EVEN MORE to share with you! Tonight is opening night for Rooftop Films! If you don’t know about them they are my favorite summer film series; they screen “new, original, independent films you won’t see anywhere else, in the company of your community, our community, and the New York City night. ” Tonight’s performance is at 350 Grand Street @ Essex- the Essex Street Academy. 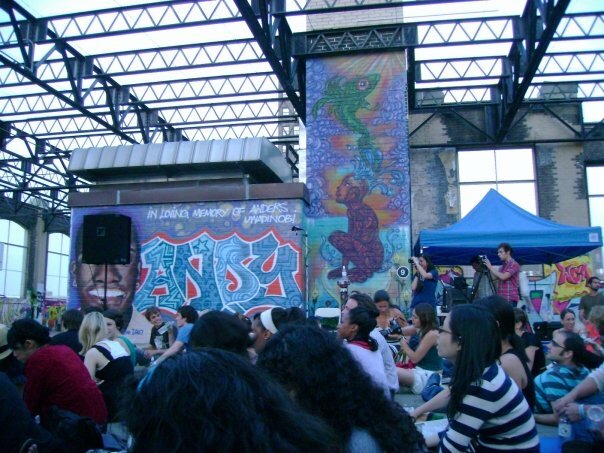 The roof has been decorated by the students with amazing graffiti art, which makes for the perfect backdrop to a program of short films, preceded by live music from Cymbals Eat Guitars. On Saturday you can observe the spectacle of the biggest Dance Parade of the summer (don’t quote me on that but it’s pretty frickin big). Starting at 28th St. at 1pm the parade will “boogie down Broadway” ending at Tompkins Square Park. Have an excellent weekend and please read yesterday’s post and Tuesday’s post for other weekend events! This entry was posted in Upcoming Events to Consider and tagged Cymbals Eat Guitars, Dance Parade, Enlighten UP!, Essex Street Academy, Rooftop Films, short films, The New York Times, yoga on May 15, 2009 by thebigredapple.